The Heacock Classic team was out at the Amelia Island Concours d’Elegance March 8-10th. Ford Heacock joined the judging team for the Porsche 911 category. Other members of the team included Harm Lagaay (retired head of design at Porsche), Dario Franchitti (3-time Indy 500 winner), Dale Miller (Porsche historian) & Michael Bartsch (Exec.VP of Porsche North America). 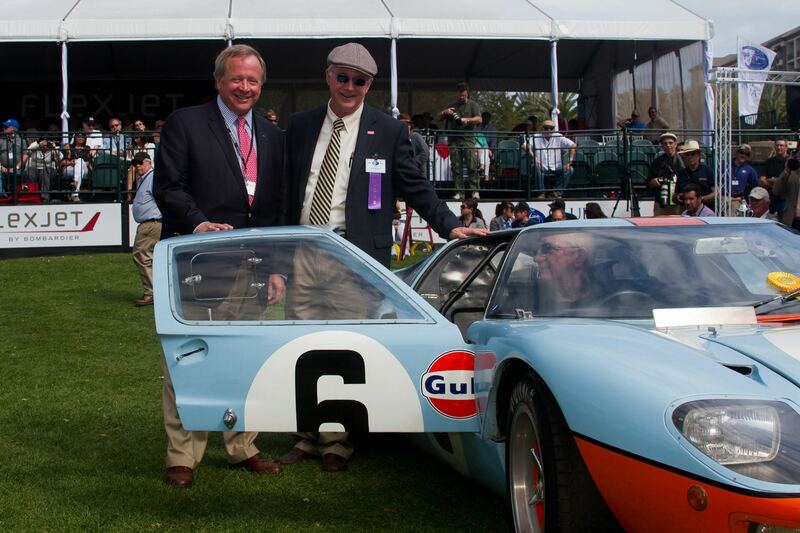 We also presented the Ford GT40 (Chassis P/1075) with the Heacock Classic Award for the Most Historic Ford GT40. This GT40 was also the Best in Show for the Concours du’Sport. Ford GT40 Chassis P/1075 is the most important GT40 as it won both the 1968 and 1969 Le Mans 24 hour races. Only 2 cars in history have ever achieved that goal. This car also scored a double victory at this year’s Amelia Island Concours d’Elegance by winning the Heacock Classic Award for the Most Historic Ford GT40 and Best in Show for Concours du’Sport. Ford Heacock and Edsel Ford II are shown above presenting the Heacock Classic award. 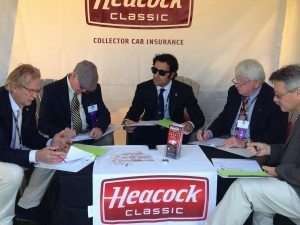 The judging team for the Porsche 911 category during the The Amelia Island Concours d’Elegance convene in the Heacock Classic tent to review their results. Left to right: Harm Lagaay (retired head of design at Porsche), Ford Heacock (President of Heacock Classic), Dario Franchitti (3-time Indy 500 winner), Dale Miller (Porsche historian) & Michael Bartsch (Exec.VP of Porsche North America).